Canadian Space Agency (CSA) Mars Exploration Science Rover (MESR). Credit: Canadian Space Agency. 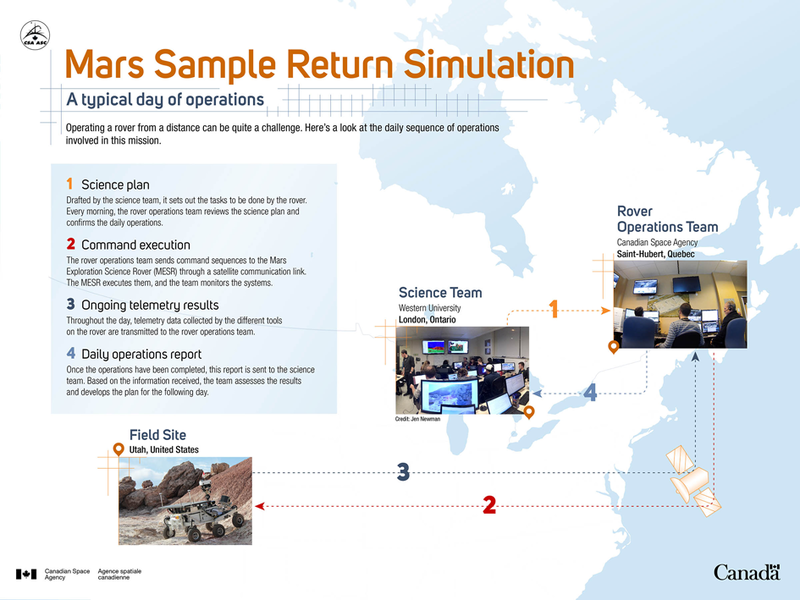 For the fourth consecutive year, a Canadian led Mars Sample Return Simulation will begin today in preparation for a future international Mars sample return mission. The simulation brings together over 50 scientists and engineers from across Canada and international collaborators from the United States, Germany and the United Kingdom. The simulation team consists of a Science Team, a Field Team and a Rover Operations Team. For three weeks the teams will focus on a Mars analogue site in Utah where the Canadian Space Agency (CSA) Mars Exploration Science Rover (MESR) will be operating. Why Do We Need a Mars Sample Return Mission? The underlying goal of a Mars Sample Return (MSR) mission according to the CSA is to answer the fundamental question of of whether life existed elsewhere in the solar system, including Mars. The CSA’s reasoning for returning a sample to Earth is consistent with previous reports on a MSR mission. In that same report it said an expected MSR mission could take place by 2011. That did not happen. A subsequent 2011 NAP report, Vision and Voyages for Planetary Science in the Decade 2013-2022, indicated the mission should take place by 2022. A MSR mission is a high priority for the CSA, NASA and the European Space Agency and is considered a critical pre-cursor mission before a human mission to Mars can take place. Other than answering the fundamental question of whether there is life in the solar system, scientists also have a practical need to know what, if any biological life, might be on Mars so that astronauts don’t bring home anything that could contaminate the Earth. The exact date of such a mission is still to be determined, but in recent years it’s become clear that such a mission should be an international collaboration. Of note, earlier this year, SpaceX, a private U.S. company led by Elon Musk announced that they would be sending a spacecraft to Mars in 2018 to demonstrate capabilities needed for a future human mission to Mars. The spacecraft, their human rated Dragon (V2), would be similar to what humans might use on a future mission to Mars. SpaceX has made it clear that they would like to send a human mission to Mars before NASA has plans to. Whether that’s realistic or not, it is putting pressure on NASA to embark on a MSR mission. At this time no dedicated Mars Sample Return mission has been scheduled or funded though different space agencies are looking at either 2022 or 2024 as possible mission dates. NASA plans to send another rover to Mars in 2020 that will be able to collect samples which could be retrieved by a future Mars mission. The MSR simulation which starts today has the following goals; To learn to identify the best samples, to retrieve and transfer them, and to validate that the best samples were collected. How will this be accomplished? From October 31 to November 10 the science team will “develop a science plan to identify and characterize rocks that may contain signs of life. Selected samples (“cores”) will then be collected using a drilling tool” according to the CSA. The science team is based at Western University in London. 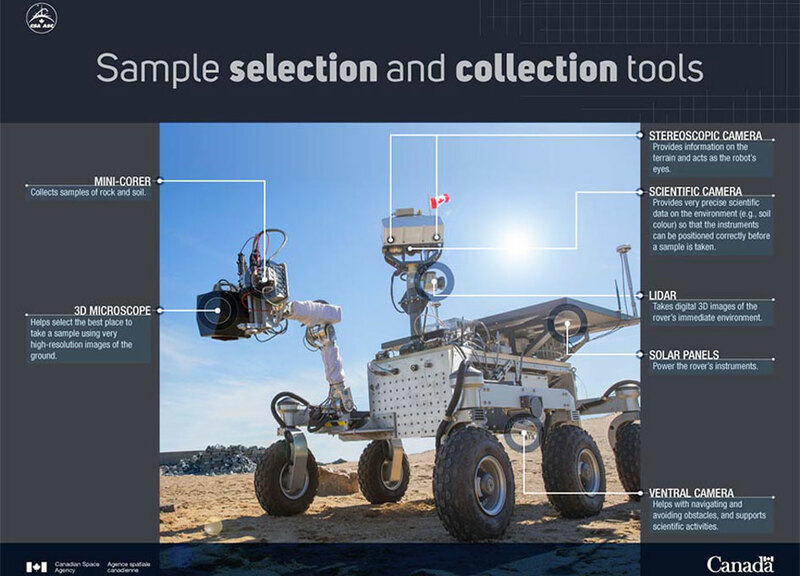 Other researchers participating on the project are lcoated at NASA’s Jet Propulsion Laboratory (JPL), the Open University in the U.K., Stony Brook University in the U.S. and industry partner, Canadensys of Bolton, Ontario. The science team is led by Dr. Gordon (Oz) Osinski from the Centre for Planetary Science and Exploration (CPSX) at Western University. His science team consists of 32 undergraduate students, graduate students and post-doctoral fellows from Western University, University of Winnipeg, York University, McGill University and the University of British Columbia. They will plan daily operations for the simulation and interpret data. After the Sample Selection and Collection phase the science team will begin the Sample Retrieval and Transfer and Scientific Validation of Samples phases which takes place between November 11 to 18. For the international space science community it’s not matter of if a Mars Sample Return mission happens, it’s when. For Canada and the scientific community, this simulation is an opportunity to develop skills needed to prepare for that mission so that Canada can have a meaningful role in such a critical mission, a pre-cursor to sending humans to the Red planet. The 67th International Astronautical Congress which took place place in Guadalajara, Mexico in late September included a plenary titled “Realizing Mars Sample Return through Human and Robotic Collaboration“. Below is the video of that event which included participation from Cornell University, ESA, NASA’s Jet Propulsion Laboratory and the Japanese Aerospace Exploration Agency (JAXA).